There are many posts on this website related to my ideas and experiences with AR. This post however, gives some of the most up-to-date examples of AR that I have found. - Group brainstorming and the description of a proposed AR project in which a digital creation would be placed into a physical situation. This poster is currently being updated, showing less of me and more of the work of HK Poly students. Augmented Reality is starting to be used in every area of our lives, and its uses will continue to increase. This presentation showcases AR projects in art, design, gamemaking, advertising, fashion, education, shopping, marketing, finance and more. 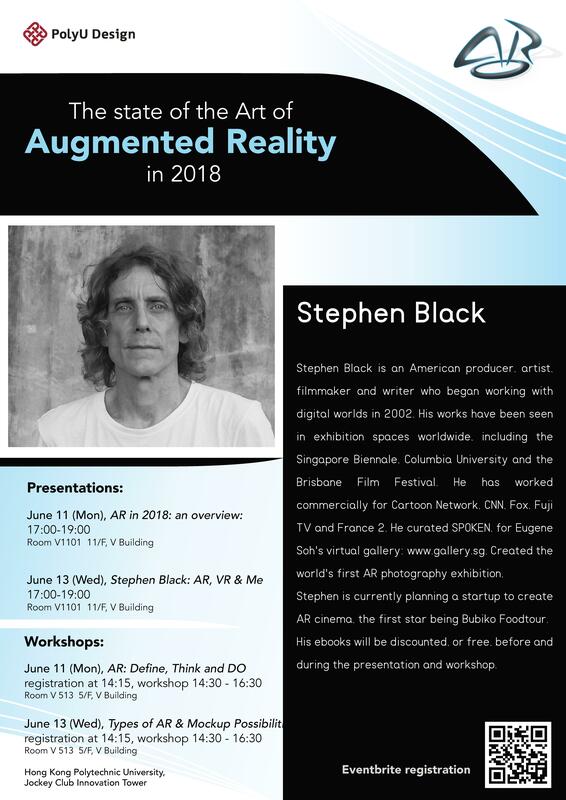 Artist, writer and producer Stephen Black began working with virtual worlds in 2002. Game-making, VR filmmaking, AR projects and more; the locations being Singapore, Malaysia, Indonesia, HK and Thailand. An entertaining and informative look at two very dynamic trends, the presentation is for anyone, IT geek or not! This entry was posted in AR, SPOKEN and tagged AR, artists, network art. Bookmark the permalink.